I have a very vivid memory of the first Agatha Christie I read, which was The A.B.C. Murders. At that time, I was in Mexico City, visiting my aunt. My aunt was a fabulous and yet somewhat disreputable person who was engaged in activities that bordered, or perhaps crossed, into the illegal. So when her young niece came to visit, she wanted to make sure I did not get into trouble, and so when she went out, she would lock me into her apartment. This may explain the anxiety in enclosed spaces I feel today, but anyway, she had a huge library of mysteries. Maigret. Dorothy Sayers. And Agatha Christie. So one day I picked up The A.B.C. Murders and was just blown away. Immediately I set about reading all of them and I have the fondest memories of sitting in an apartment in the middle of Mexico City and reading about these crimes in the British countryside. 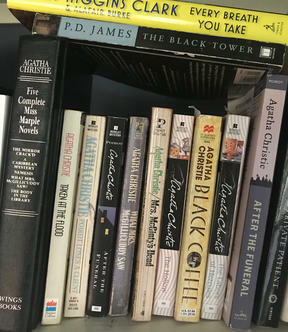 So, with that in mind, I asked my fellow Miss Demeanors if they could remember the first Agatha Christie they read, and this is what they said: Alexia: I know it was one of the Hercule Poirot mysteries but I don’t remember which one. I was in 7th or 8th grade when I read it. Paula: Honestly I don’t know. I feel like I’ve always known all the stories. My mother read mysteries, so they were always around the house, especially when my father was overseas. So I probably got started in the third grade when Dad was in Korea, and finished up when he was in Vietnam. By then I just read whatever she read: Agatha Christie, Ellery Queen, Nero Wolfe, Perry Mason, etc. I loved them all.I do remember finding The Sensuous Woman by J under her pillow back when I was in high school and sneaking it out to read it…but that’s another story. Robin: My parents used to go on shopping sprees at our local library’s annual fundraising book sales to get collections by particular authors. Agatha Christie was one of them and I suspect it was because of me. We saw the 1974 version of the film adaptation of “Murder on The Orient Express” and I loved it, even though I was too young to understand the historical context. Although it did spark my interest in learning about the Lindbergh baby kidnapping and reading true crime stories. I’d read 3 or 4 of the Poirot books when my parents took me to see the movie “Murder By Death.” Is it sacrilege to say the Agatha Christie-inspired spoof is still one of my all-time favorite mystery movies? Alison: The Mirror Crack’d from Side to Side. I then went on to read almost all the rest, but remember having trouble finishing Nemesis. One weekend when my husband (then fiancé) was in graduate school, and I was still in college, he was supposed to come visit me, but contracted a terrible cold and couldn’t get out of bed. I took the night train from Boston to Philadelphia and read Agatha Christie to him for almost two days straight. When I headed back to school, he was feeling better. I credit his recovery to the healing powers of a good mystery. I’ve attached a picture of what is left of my collection. For some reason, Agatha Christie books tend to disappear. Tracee: Sleeping Murder. Cate: : …And then there were none. Tracee: Now I’m second guessing myself. Perhaps Death on the Nile! Michele: Murder on the Orient Express. So there you have it! Thanks for coming on my journey this week. Do you remember the first Agatha Christie you read?